Vi følger Webinar: World Wide Free Seminar of the Family Dog Project, live! Family Dog Project ble grunnlagt i 1994 for å studere ‘atferder og kognitive aspekter av hund-menneske relasjon’ (“the behavioral and cognitive aspects of the dog-human relationship”). Forskere, hundeeiere og hunder samarbeider i forskningen. Webinaret tar for seg interaksjon mellom hund, menneske og robot, mekanismene i sosial atferd og hund-menneske-relasjonen. Nå er også videopptak av webinaret tilgjengelig. On behalf of the organizing committee of the 3rd Seminar of the Family Dog Project, we proudly present our yearly largest public event on canine science – coming directly from researchers to the professionals and dog enthusiasts worldwide. The Family Dog Project at the Department of Ethology, Eötvös Loránd University (Budapest, Hungary) is the largest and oldest research group with more than two decades of its activity dedicated to the investigation of the dog-human bond and co-operation. This is the third year when we provide a free seminar to everyone who is interested in our most recent discoveries. This event is also for showing our gratitude to those who constantly support our work by participating at our tests with their dogs, and completing our online questionnaires. All the presented talks are based on scientific papers published by our authors in 2015. Sincerely yours: Prof. Ádám Miklósi, DSc, Enikő Kubinyi, PhD, Péter Pongrácz, PhD”. Kilder: Web: Family Dog Project. Stream. Facebook: Family Dog Project. 15:50 Anna Gergely Was this a pointing or not – what makes a simple movement communicative? 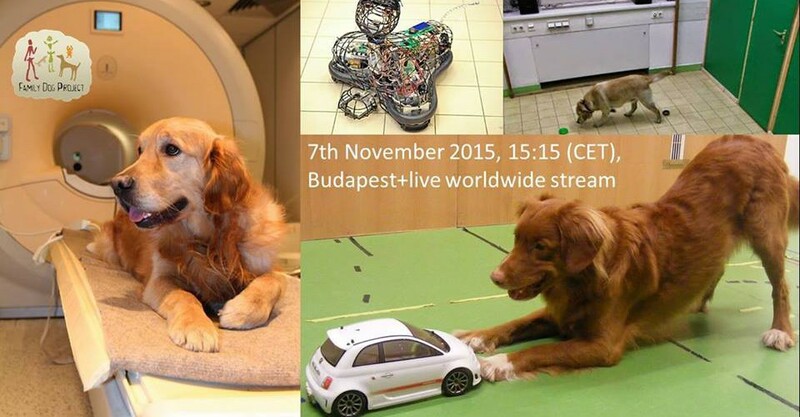 18:10 Attila Andics How does dog brain process stress? 19:10 Márta Gácsi Eyes or nose – which navigates our dogs? 19:30 Vera Konok Does the personality and attachment style of the owner influence the separation anxiety of the dog? 20:10 Tamás Faragó Barks without boundaries – do people in different countries understand dog barks similarly? 20:30 Péter Pongrácz The dark side of barking – what makes dog barking a nuisance? Robots are getting very popular. Researchers like them too because they can offer many new ways of investigations. Dogs may also show some social behaviour towards them under specific conditions, and it is a very interesting question how this relationship is comparable to dogs’ relationship with humans. Also, on a more futuristic level one may ask how or whether the human-dog bond may change in the new technical age. If I ask dog owners whether their dogs understand their pointing gesture, most of them say yes of course! If I ask them whether their dogs born with this skill or learn it, the answers are more divided. In this study we used a novel method in order to investigate the aforementioned question. We found that after a short social interaction dogs utilized successfully an unfamiliar self-propelled objects’ movement to find a hidden food. Rapid learning in our study highlighted the importance of innate sensitivity to directional movements and suggests that social skills of the dogs might be more flexible that we thought! 3. The story of the remote controlled car that deceived a dog. Judit Abdai, PhD. When offering dogs a smaller and a larger food quantity most of them choose the latter one. This is not a surprise. What is more surprising is that when a human (even a stranger) indicates the food quantity opposite to the primary preference of the dog, they tend to follow the human’s indication. Is this social bias is restricted to human partners alone? In this talk I show that in some cases an unfamiliar self-propelled, non-living agent can mislead dogs in such situation as well; however without the special bond between dogs and humans this little agent probably would not have a chance. 4. The effect of oxytocin on dogs’ social behaviour. Anna Kis, PhD. Oxytocin has earned itself the name of “magical trust elixir” in the popular media due to its positive effect on several complex human behaviours. At the same time as recent human studies point to the fact that the effect of oxytcin is not as straightforward as thought before, research has started to investigate this relationship in dogs as well. The talk will present two studies on the effect of oxytocin on dog behaviour and discuss the potential applied importance as well as the limitations. 5. What or where? How dogs read human pointing gestures? József Topál, DSc. There is a general impression among naïve “dog-lovers” that a dog’s mind often works in a childlike manner. Although this belief has long been rejected by most scientists, the situation in the last few years has radically changed. There is increasing scientific agreement that dogs often effortlessly ’understand’ what the behaviour of their human partner is about and they identify human communicative behaviours in ways similar to preverbal human infants. We present some empirical evidence of dogs’ ability to read human pointing gesture. Our experiments show that (1)dogs are sensitive to the order of signal sequences and (2)human pointing refers to a direction or location for dogs, but only if the gesture is preceded by signals indicating the actor’s communicative intention. 6. The genetics of greeting. Enikő Kubinyi, PhD. Meeting humans is an everyday experience for companion dogs, and their emotional reactivity in these situations is of major interest to owners and trainers. According to our results it is highly likely that oxytocin and opioid receptor gene variants affect this behaviour. However, ontogenetic experiences has an important role too: while every second beagle do not approach a friendly, unfamiliar woman in a greeting test, only a minority (3%) of family beagles do so. 7. How does dog brain process stress? Attila Andics, PhD. Dogs seem to differ in what sounds they find scary: fireworks, thunderings, growling dogs or shouting people. But we know little about how they process stressing information. The talk will present a new dog brain imaging study. We found, using functional magnetic resonance imaging (fMRI), that different brain regions process social and non-social stress in dogs, and that certain brain response patterns are good predictors of how fearful a dog is of a specific stressing sound type. 8. Eyes or nose – which navigates our dogs? Márta Gácsi, PhD. It is widely known that dogs have a super sense of smell. But do untrained family dogs spontaneously utilize their highly effective noses for problem solving, for example to find their owners in a room if they cannot see her? In the present paper we report two studies that examine what strategies family dogs use in two types of olfaction-based tasks and how successful they are at various distances. Our experimental results suggest that despite their potential ability to successfully collect information through olfaction, family dogs often prefer other strategies (for example, using visual cues or win-stay strategy) to solve a basic choice task. 9. Effect of owner’s characteristics on the separation anxiety of the dog. Veronika Konok, PhD. 10. Various ways to investigate aging in dogs. Dóra Szabó. Everyone gets old, even our dogs. But the devil lies in the details. What is the difference between ‘simply old’ dogs and dogs suffering from dementia? What do we know about age-related cognitive changes and what can we do against them? Why is it so complicated to study it in family dogs? For instance, results suggest that while old dogs will not pay as much attention to moving objects anymore, their interest in people still remains. In this talk I will summarize what is currently known based on scientific studies around the world and what are the blank spaces needed to be filled during the following years. 11. Barks without boundaries – do people in different countries understand dog barks similarly? Tamás Faragó, PhD. Although humans seem to be surprisingly successful in assessing the emotional state of dogs from their barks, some cultural differences can affect this ability. To test this we replicated our former study on Portuguese participants where they had to listen to barks and rate the inner state of the dogs or try to figure out the social context of the barks, then we compared their responses to our Hungarian sample. During my talk I will show the striking similarities and surprising differences between the two group of people. Also I will present some interesting effects of gender and individual experiences. 12. The dark side of barking – what makes dog barking a nuisance? Péter Pongrácz, PhD. Barking is one of the most characteristic features of dogs. In the last decade ethologists discovered several aspects of the communicative value of dog barking. At the same time, it remained uninvestigated why and what type of barks annoy people the most – contributing to the environmental noise pollution. In a joint study between Hzngary and Brazil, we found that men are annoyed more by barking than women. From acoustical aspects, high pitched (‘complaining’, ‘desperate’), and deep, harsh, fast (‘aggressive’) barks annoyed people the most. These effects seems to be universal for participants in Europe and the new World. Foto/kilder: Web: Family Dog Project. Stream. Facebook: Family Dog Project.